Jerry William Ray passed away on May 3, 2016, at the age of 71 doing what he loved best… puttering. Jerry was born on September 4, 1944 to Blaine and Loraine Pennell Ray in Monnet, MO. He lived most all of his life in Olathe. He married Linda Lueck Ray on April 2, 1966. After just 2 short months of marriage, Jerry was drafted and served 2 years in the Vietnam War. He was honorably discharged in 1968 with many awards, including a purple heart. Once back home in Kansas, he became the proud owner of Messer’s Clothing Store where he met and made life long friends. To this day, his friends have carried him through life with their loyalty and support. In 1980 he sold Messer’s and followed his passion, creating J.W. Ray, Construction, Inc. Jerry worked in the construction industry until retirement in 2003. Jerry and Linda raised their two children Jennifer L. Ray Cecil and Ryan W. Ray in Olathe, Kansas until they decided to embark on a life-long dream of living in the country. They moved to Baldwin City, Kansas in 1988. Jerry loved living in the country, as he was able to work in his wood working shop, maintain an immaculate lawn, plant in his garden and just enjoy the outdoors. Linda tragically passed away on March 18, 1995. Jerry married his second wife Sally Howell Ray on July 6, 2002. They built a house on acreage in Olathe where he continued his love of the outdoors. They enjoyed retirement, traveling and spending time with friends and family. 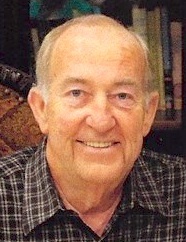 Jerry is survived by his wife Sally Howell Ray, his daughter Jennifer Ray Cecil (Bryan), his son Ryan Ray (Lisa), his brother Jim Ray, Sally’s son, Ed Austin (Laura) and daughter, Heather Volman (Todd), and 10 grandchildren: Alexandria, Jack, Julia and Beau Cecil; Olivia and William Ray; Nathalie and Spencer Austin; Ava and Julia Volman. Jerry’s life revolved around his grandchildren. He spent many hours supporting them in all of their activities and being their biggest fan. Jerry will be dearly missed and forever in our hearts. Jerry was preceded in death by his first wife, Linda Lueck Ray, his parents, Blaine and Loraine Ray and sister, Patti Ann. All services will be held at Grace United Methodist Church in Olathe, Kansas. Visitation is May 6 from 6-8pm; the funeral Saturday, May 7 at 10:00am; and a Private burial will be held at Oakwood Cemetery in Baldwin, Kansas. In lieu of flowers please make contributions to Wounded Warrior Project. In his absence, we know his memory lives on through all his friends and family that love him dearly.